I love a good pizza, but making it at home is always a bit of a gamble. Domestic ovens can never be relied upon to give the same crispy base that you get from a scorchingly hot commercial pizza oven. I’ve tried many things in search of pizza perfection, ranging from special perforated pizza trays to pizza stones. Pizza stones work, but only if you preheat them for AGES until they are incredibly hot. This uses an enormous amount of energy which is fine if you are making a heap of them, but not so good if you are making just one. 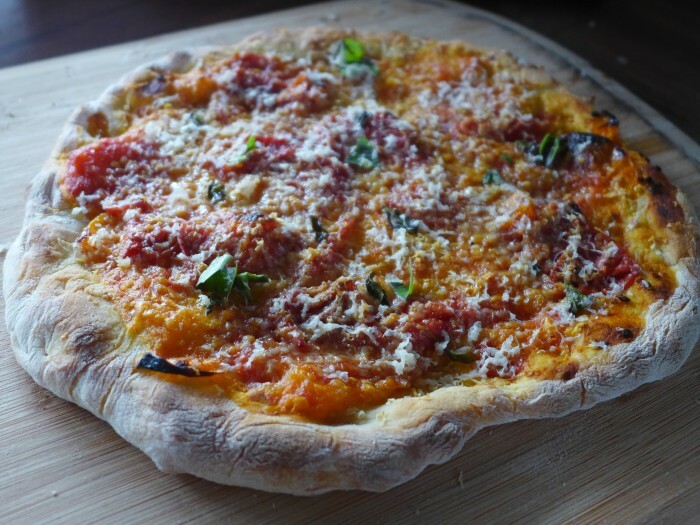 I usually have a batch of no-knead dough on the go a couple of times a week and often I steal a bit for a pizza. This morning I’d run out of bread for breakfast and so I grabbed a piece and made a flatbread in a heavy frying pan. Apart from being delicious, guess what? The base was super crispy and of course I immediately thought of pizza. For lunch I grabbed another bit (that loaf of bread is getting smaller!) and made a pizza. This time I threw the dough base into a dry frying pan for a few minutes until it was lightly spotted and starting to crisp up on the bottom. I then removed the base and added the toppings, just some simple oven roasted tomatoes, a very light dusting of Cheezly mozzarella and some fresh basil and put it into the oven as normal. Pre-cooking the base like this has the added advantage of making the base rigid and thus easy to wrangle into the oven. And it worked. Perfect. Crispy. Delicious. Ooh, what a great idea! It does look like a perfectly crispy pizza too. I’m just slapping my forehead I didn’t think of it before!